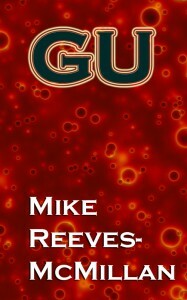 Having recently discovered how damn easy it is, I've published Gu in a Kindle edition. Part of what I can do with KDP Select is make it free for a period of time, which I'm doing - for two days, starting at midnight Pacific time on the 24th (I don't get to choose the time, unfortunately). The process didn't take long. I used the Anthologize plugin - which is buggy as anything (and refuses to update) but is quicker than copying-and-pasting a bunch of blog posts - to get it out to an RTF file. Then I fixed up the missing spaces, lost italics and incorrect special characters, changed a few words and a chapter title, and there I was. I then created a quick-and-dirty cover using a Creative Commons-licensed Flickr image and the online photo editor Pixlr (since I was on a computer that lacked either Photoshop or Gimp). I've since done a Photoshop version that's a bit more cromulant (shown here). I wouldn't do this for a book that I thought would do really well, but Gu hasn't exactly attracted a big audience in blog form and I don't expect it to get one as an ebook either, so I wasn't about to spend much time, or any money, getting a proper cover done. I just want to get it out there in basic form. If you enjoyed it here on the blog, please go and leave a review. (The text is essentially the same.) Thanks! It’s had 227 (free) downloads so far, which got it into the top 10 free books in a couple of categories (unfortunately including technothrillers, which it’s not). It’ll be interesting to see if there are any actual sales. And nobody has left a review yet… HINT HINT. Doesn’t have to be a 5-star review, make it honest.